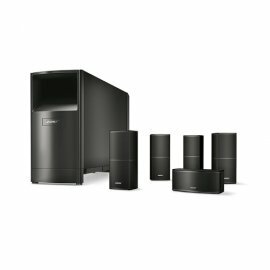 The Bose Acousitmass 10 Series Speaker System, the perfect item for home cinema enthusiasts, beat the best performing system along with the pairing of the redesigned Direct Reflecting Series II cube speakers they go nicely with your HDTV. With advanced bass performance it allows you to enjoy entertainment further. Cables and connectors included, with marked easy setup. The Direct/Reflecting speakers have been improved with providing strong sounds with a small design. A match for your HDTV and mount it to your wall with optional brackets to get a totally immersive experience with the angled drivers inside the speaker. Easy to install and smaller than the previous model. The Acoustimass System features technologies and two powerful, downward-firing drivers for the sound impact you want. With pure deep sound without audible distortion. You can tweak the low-frequency effects with the adjustable controls, set it up to your preference.